There are very few new construction neighborhoods left in Fort Collins and this is one of them. It offers energy-efficient homes ranging in price from the upper $200s to the low $300s. The neighborhood is bordered by the Pelican Marsh Natural Area, which is a beautiful nature preserve that is great. There is a Fort Collins city park is pending construction and easy access to I25. You can get to Loveland and Denver very easily by just hopping on I25. Centerra in Loveland is very convenient for shopping and is a great meeting place where you will find all the great stores and restaurants including Bent Fork, Biaggio’s, Rock Bottom Brewery, PF Chang’s and all the shops you could desire, such as Macy’s, Charlotte Russ, Gymboree, Children’s Place, Gap, White Black Market, J Jill, Loft, Coldwater Creek, Eddie Bauer, Barnes and Noble and much more. 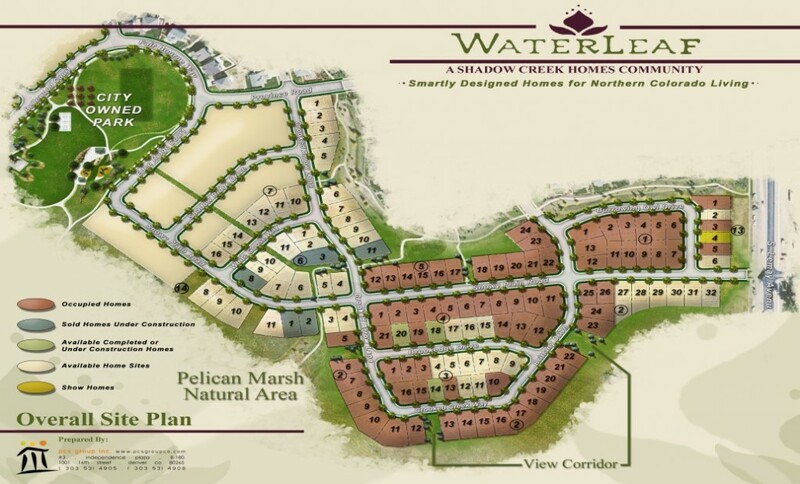 Waterleaf has the draw of building homes with a standard finished basement and three car garages standard on all floor plans. There are nine plans to choose from and so they offer something for everyone. Currently there are 5 homes for sale starting at $309,900 for a 3 bedroom 2 bath home with 1890 square feet to $354,900 for a more upgraded, larger home with 4 bedroom with 3 baths and 2281 square feet of living space and a three car garage. The Thompson R2-J School District serves more than 15,000 students at 18 elementary schools, five middle schools, and five high schools. The district is a leader in curriculum and student well-being improving test scores. Currently students living in Waterleaf would attend Cottonwood Plains Elementary School, Lucille Erwin Middle School and Loveland High School.